Maybe this page should be titled "Softball for Evolutionists" because these questions are softballs. Their best use is in establishing that creationists refuse to take the time to understand or research the scientific theory that they are trying, poorly, to attack. 3. Where did the laws of the universe come from? 12. Natural selection only works with genetic information available and tends only to keep a species stable. How would you explain the increasing complexity in the genetic code that must have occurred if evolution were true? There are theories for this, but they have nothing to do with the theory of evolution. For a Christian like me, this is a particularly sad question. The expansion of the universe is a phenomenal and breathtaking subject. Space itself is expanding. Ancient and far away galaxies are moving away from us at faster than the speed of light. 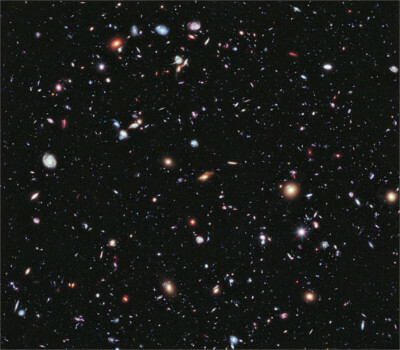 Image captured by the Hubble telescope picturing about 5,500 galaxies. It is possible because those galaxies are not really moving that fast. Instead, all galaxies are being separated from one another as <em>space actually grows</em>. Like dots on the surface of a balloon that is being blown up, the galaxies rest in an ever-expanding fabric of space time. Between us and the most ancient galaxies we can see, there is so much space that we are being separated faster than the speed of light. This is astounding and a glimpse of the glory of God in the heavens. Anti-evolutionists, however, cannot enjoy it, and they cannot be moved to worship God by it. They are so busy telling God and the rest of us how he made the cosmos that they have no time nor inclination to actually look at it themselves. Science has an excellent theory to explain this. It, too, ought to be of great interest to Christians and of great glory to God, but anti-evolutionists won't look at it. However, this question, too, has nothing whatsoever to do with evolution. I don't think science has a good answer to this question. It is irrelevant to evolution, though. Whether it is perfectly organized is debatable. How the universe got to its current state is pretty well understood. Again, though, this question has nothing to do with evolution. 5. Where did the energy come from to do all the organizing. Mostly from the Big Bang, but this question is irrelevant to evolution. Science doesn't deal with why things happened. It looks at nature, conducts experiments, and tries to determine what happened and how. Life came from non-living matter more than 3.5 billion years ago. It's even possible that the leap from non-living matter to something that could be called "life" happened off earth or outside the solar system, then was transported here by meteorites or asteroids. There are several theories about how life originated. None have won scientific acceptance yet. The origin of life is known as abiogenesis. It is very relevant to evolution, but it is not evolution. This is basically a repetition of question 6. There are some good theories; none have won the day; this has nothing to do with whether evolution happened. It took a moment for me to understand this question. I thought it was a request for the specific part that the first cell used in reproduction. I was a little weirded out by the request. Now, I realize that the inquirer wants to know where the partner of the first cell to reproduce sexually came from. The first cell to reproduce sexually probably had no partner. It had its own male and female organs, just as some plants and most fungi do. I have to suppose that the inquirer is going out of his/her way to prove that he/she is absolutely ignorant of evolution and entirely committed to remaining that way. The questions in parentheses are not related to the question being asked. These should have been two questions. Plants may and animals certainly do "want" to reproduce, but the first reproducing cells surely did not. Simple laws of nature drove the replicating cells to grow and then to reproduce. It did not consider the amount of resources in the environment, it simply used what was available. That is still going on today. Animals are very prone to reproducing until they have consumed all their resources, then they die off from starvation. Over time, as a population evolves, natural selection tends to produce ways to prevent continual growth leading to starvation. To answer the unrelated questions in the parentheses, evolution occurs in populations, not individuals. Species evolve, but if there is more than one population in a species, then it is possible the each population my evolve in a different direction or that only certain populations evolve, at least in the short term (say, 1-10 million years). The amazing thing about DNA is that there is no English and Chinese. There is only one code, read by all cells of all the kingdoms of life. Just one language. The tower of Babel has not infiltrated the microscopic world of the cell. Mutations produce new and improved varieties in several ways. Pure chance in multiple single-point mutations can produce an improvement, though that's not very likely in one generation. Duplication of genes followed by mutation in the duplicated gene, unchecked by natural selection because the second gene is superfluous, has produced many changes in evolutionary history and is an excellent source of improved varieties. Further, vestigial organs are an excellent source of new varieties. Because the organs are not necessary, they can evolve by mutation into new roles. Since deleterious new functions will be weeded out by the death of the individual, while improved function in relation to the population's current environment will be preserved, it is a simple matter of time until there is significant enough change to the vestigial organ to transform it for a new function. If you don't want to research an answer to this question, then sure it's possible. Once you start doing research, however, the idea that similarities in design indicate a common design fails. Too many things in nature are poorly designed. Everything in nature seems to have evolved from similar ancestors, usually found in the same geographical location but in deeper strata of the earth. Organs are adapted for new uses (such as the swim bladder of fishes becoming the lungs of reptiles and humans). Most animals are not designed as though they were made the way they are now from scratch. Instead, they are a hodgepodge of accumulated adjustments knit together into a patchwork frame that contains many inefficiencies. 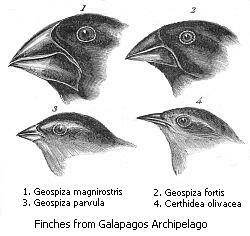 No, the more we look, the more it looks like common descent rather than common design. See pseudogenes for more on this subject. I answered the question posed here in my answer to question 10. As for the statement that precedes the question, it is not true. Natural selection doesn't do anything. Natural selection is a description of a simple process. If an individual is not fit for survival or reproduction, he does not produce any progeny. His genes are lost. The more fit you are, the more you reproduce, and the more your progeny reproduces. Therefore, sometimes natural selection destroys entire populations and makes them extinct. A rapid environment change such as an ice age, a volcano eruption, a large meteorite, a flood, or many other environmental changes can drive a population to extinction. If much of a population is destroyed by some environment change and only a few hardy individuals survive, then you have evolution. There has been a change in alleles (the types of genes) in the population. It has, by definition, evolved. Enough of those changes in genes, over a long time, and nature can produce some extraordinary transformations. So the writer of this question is saying, "I don't want to do any research on my own. I want you to present an entire class on biology and evolution while I hold my ears and chant 'I'm not listening,' and when you're done, I'll think of more things I don't believe and ask about those. However, for people that are not as obviously hypocritical as the asker of this question, I will address them. For all of these questions when and where would be a nice thing to know, and for most of these we do know when and where. However, whether we know when or where is irrelevant to whether evolution happened. If we have strong enough evidence that there was a change from single-celled to multi-celled animals to fish to amphibians to reptiles to birds, then it is irrelevant whether we have found the exact moment it happened. Why is always irrelevant. That's not a question science answers. How is just like when and where. It's nice to know, but as proof against evolution, it's irrelevant. Darwin did not know how a reptile could evolve into a bird. In fact, he didn't know that reptiles did evolve into birds. Nonetheless, he was still able to come up with his theory. Now that we do know how it could happen, having discovered DNA and understanding how every cell in nature can read the same DNA and interpet it the same way, we understand very well how a fish could become an amphibian. So as it turns out, how is an excellent support for evolution, though our ignorance, if we were ignorant, could not be used as a valid argument against evolution. I've now answered how. Let's look at some when and where's. Where that happened is unknown. When that happened is very general knowledge. It happened somewhere between 3.5 billion years ago, the date of the earliest life we have found, and 570 million years ago, when we find the earliest multi-cellular life. That it happened is known from the fossil record. That it can happen has recently been proven because it did happen in a laboratory (link accessed 10/28/2013). The best example of a fish to amphibian transitional species is Tiktaalik. So the "when" is during the Devonian period about 370 million years ago. The "where" is kind of a neat thing because the scientists who found Tiktaalik were looking in that area on purpose. They researched spots that were most likely to be the location where the transition from fish to amphibian occurred. They were able to do this because of previous fossil finds. The spot they chose was Ellesmere Island in the Nunavat territory of Canada. Previous research turned out to be reliable, and they were led to this terrific find. I have to research this to answer the question. I don't have evolutionary history memorized, though if I were a scientist, I would have memorized a major transition like this. I'm not a scientist, so this will have to wait until I have more time. I'm sure anti-evolutionists, who don't like to do any research, won't do this research on their own. I'm going to wait to do this research. All you have to do to know the answer to this transition is to follow the news. The falsified dinosaur-to-bird transition that National Geographic embarrassed itself with was international news. However, that transitional fossil was one small part of a flock (pun intended) of feathered dinosaur fossils that have been found over the last few decades. One of the more interesting classifications are the enantiornithes, which may be a subclass, superorder, or infraclass. That gives the when and where. In years, the Cretaceous ran from 135 million years ago to 65 million years ago. In his case, where is all over the world. The author of these questions didn't even slow down to think while he wrote them. Since he had a list of transitions, which intermediate forms he is referencing cannot be known. The simplest answer to his question is that they lived by eating, excreting, and respirating like all other animals do. It is the kind of question that says, I am too lazy to learn anything at all on my own. Therefore, everything I ask will be tinged by ignorance, and occasionally I'll ask a question that is framed, formed, and finished with ignorance. All I can (wildly) guess is that the inquisitor is assuming that, say, a fish to amphibian intermediate form must be without a means to survive because its gills were becoming lungs. That's not what happened, however. A transitional species like Tiktaalik would have had both rudimentary lungs, evolved from the swim bladder of its ancestors, and the gills it inherited from its ancestors. I hope to finish answering the other 18 questions, but I think this is a good start. Our Creationism vs. Evolution Debate page has more questions and answers like this from me. It also has a lot of other discussions, by others, about questions like the ones above.